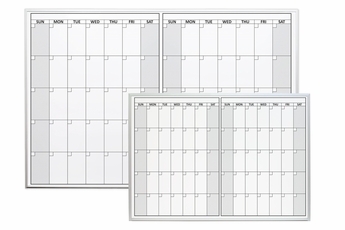 Two month dry erase calendar options from OptiMA Inc. Track up to two months on one dry erase calendar. Select from magnetic receptive or a more economical non-magnetic format. The magnetic two month calendars let you use all kinds of magnetic accessories on your calendar. Magnets can be a very useful if you have repeating obligations or things that need to be done. 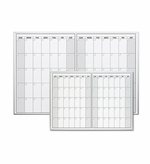 The non-magnetic dry erase two month calendars have the exact same excellent dry erase writing surface as their magnetic counterparts but you can't stick any type of magnet to the writing surface. However if you're not planning on using any magnetic accessories, why pay the extra cost? 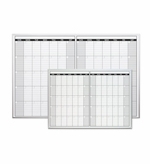 Non-magnetic dry erase calendars are the perfect economical choice. There is also a modular calendar kit that allows you to create a two month, three month or even larger rotating magnetic calendar.